Members of the public will have an opportunity to play an active role in the future development and enhancement of local sections of the Ulster-Ireland International Appalachian Trail (IAT) at two specially arranged public stakeholder workshops on Tuesday June 6th. The events are being held in the Derg Valley Leisure Centre in Castlederg at 1pm and later the same day at 6.30pm in the Newtownstewart 2000 Centre. Tourism Officer at Derry City and Strabane District Council, Philip McShane, urged stakeholders and those with an interest in the trail to attend the workshops with a view to helping shape and influence its development. “The work towards tapping into the local tourism potential of the International Appalachian Trail is well under way and this event is the perfect opportunity for business owners, community groups, walking clubs or any other stakeholders to get involved in that process and learn more about the opportunities it could bring to the local area,” he said. “The workshops will discuss developing the actual walking route and its infrastructure, creating visitor experiences, providing walker friendly services, packaging the offering and other community and rural economic development opportunities so that the full potential of the Ulster Ireland International Appalachian Trail can be realised. 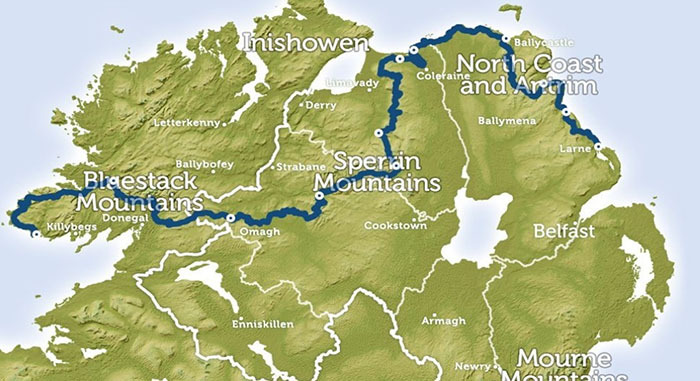 The current Ulster Ireland section of the International Appalachian Trail (IAT) is 280 miles long and runs from the West Coast of Donegal, through the Sperrin Mountains and along the north coast of Antrim before finishing in Larne. While this section of the trail is in its “infancy”, having only been officially launched in 2013, the terrain to which it and the wider International Appalachian Trail belongs finds its origins in the continental drift of some 250 million years previous. At that point the remnants of what is now called the Appalachians/Caledonian terrain ended up in eastern United States, eastern Canada, Greenland, Scandinavia, Britain, Ireland, Brittany, the Iberian Peninsula, and Morocco. When expansion of the entire IAT is completed it will be the largest trail network in the world and has the potential to be a major outdoor adventure brand with a presence in 21 countries, three continents and a home market of over 800 million people. The extent of the potential is not lost on those taking the lead locally in the trail’s development. Derry City and Strabane District Council has commissioned a scoping study, on behalf of Derry & Strabane Partnership and other participating LAGs, to develop the Ulster-Ireland International Appalachian Trail as part of a cooperation project within the Rural Development Programme. Acknowledging the potential economic and community benefits of developing our section of this international trail, the Chair of Derry and Strabane Rural Partnership (LAG) Cllr Patricia Logue said this was a great opportunity for the rural area. “We are delighted to be the lead partner on behalf of the other participating LAGs in Donegal, Fermanagh and Omagh, Mid Ulster, Causeway Coast and Glens and Mid and East Antrim,” she said. “These consultation workshops are part of a scoping study to identify gaps and priorities in each area that could be addressed through a co-operation project whilst also exploring potential to grow business and create economic opportunities along the route as well as deliver community benefits. “I would urge anyone interested in maximising this potential to attend one of the workshops”. The NI Rural Development Programme 2014-2020 is funded by the Department of Agriculture, Environment and Rural Affairs (DAERA) and the European Union. To confirm your attendance at the Stakeholder Workshops contact Duane Fitzsimons on 028 9030 3930 or email duane@outdoorrecreationni.com.